Have you heard that a Full House revival might be in the works? Don’t call me a hater, but I’m really not interested in seeing Jesse & The Rippers twenty years later. And if the last thing Dave Coulier ever did publicly was stomp on Alanis Morissette’s heart (inspiring her revenge anthem “You Oughtta Know” in the process), I could live with that. I simply have no desire to revisit the Tanner clan, especially when so many other deserving sitcoms languish in the television graveyard. If you’re going to revive anything, how about Seinfeld? Jerry and the gang never got a proper sendoff, anyway. I’d love to see what schemes Kramer would come up with a decade and a half into the 21st century. Besides, we could use some fresh new catchphrases. Think of all the great contributions Seinfeld made to the English language! Spongeworthy. Yadda yadda. “Master of my domain.” Low talkers. Close talkers. Festivus. “Not that there’s anything wrong with that.” I don’t think there’s ever been a show so consistently fresh and funny. I’d love more Jerry! I’d also be down for a Friends revival, even if the only characters returning were Joey and Chandler. They could do a lot with 22 minutes every week. While we’re at it, let’s bring back Cheers. Or Family Ties. Or Charles In Charge. Hell, even Perfect Strangers is more deserving of a second shot, in my opinion. 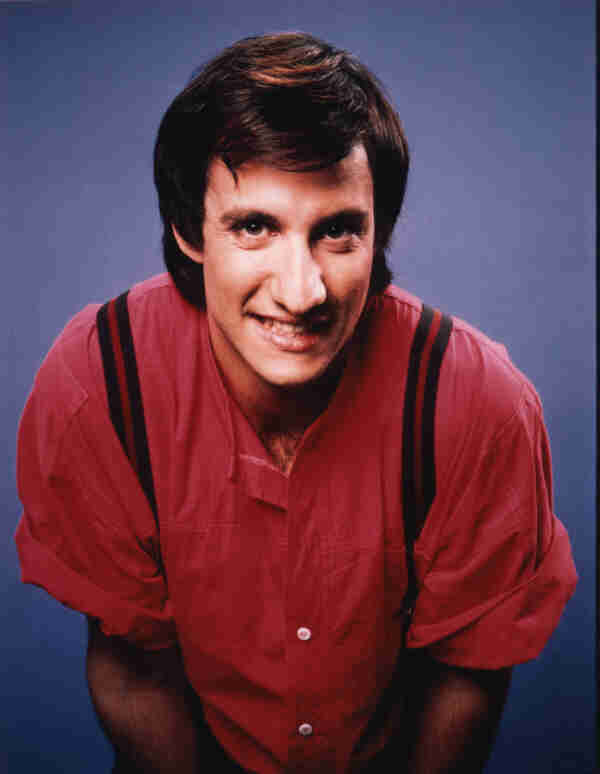 There’s no such thing as too much Balki. I kinda miss this guy. So, we leave this evening for Nevada. I’ve been prepping Audrey in advance by giving her some tips on how to fit in. Like, for instance, she has to call a creek a “crick” and the glove compartment is actually a “jockey box.” And scones as we know them here are nothing like the scones out there (or the scones in jolly ol’ England, either). She has spent an inordinate amount of time figuring out how swaggy to look. I had to break it to her that Nevadans don’t give much thought to swag…at least not those in the part of the state we’ll be visiting. Ahh, teenagers. Yesterday I was packing, and realized I’ve really got it down to a science after so much traveling these past few years. At one point, I even found myself piling up clothes in the order in which they will be worn. She even listed items that were currently in the washing machine as she was compiling her notes. And she’s got outfits broken down by day and night. I’m beginning to think my daughter might be a little bit OCD. Tonight, we’ll hit Baker City, Oregon. And then tomorrow it’s on to Ely. One of my first blog posts was entitled, ‘Full House Hell.’ So, NO to a reunion, spinoff, remake, etc! I’ve found very few shows stand the test of time, but Seinfeld sill makes me laugh. Just realized Walter on Breaking Bad played Jerry’s dentist. I knew he looked familiar! I follow a few Twitter accounts like Modern Day Seinfeld. To think what hijinks Kramer and George could get into with YouTube and smartphones! Whew! I was worried I might start receiving hateful comments from people who own “I Heart Danny Tanner” t-shirts. Luckily, it appears I’m not the only one with a disdain for such a sappy show. Although that might be a bit harsh…it was an innocent enough (if saccharine) diversion in its time. I just don’t see WHY we need to dust it off and start airing new episodes. Omg I feel SO much better about my master packing spreadsheet (which, for lengthier trips, does indeed include a chart for what coordinates with what and is supposed to be worn when). So… this is normal packing behavior, right? RIGHT? Depends on your definition of “normal,” I suppose! This is the first time I’ve ever done such a thing…which clearly means that my wife is rubbing off on me, because it’s such a “Tara” thing to do. ere aired. That’s how I feel about “Golden Girls.” I liked it when it was on, but enjoy it so much more 22 years later. HAHAHAHAHAHA! OMG…her list cracked me up! 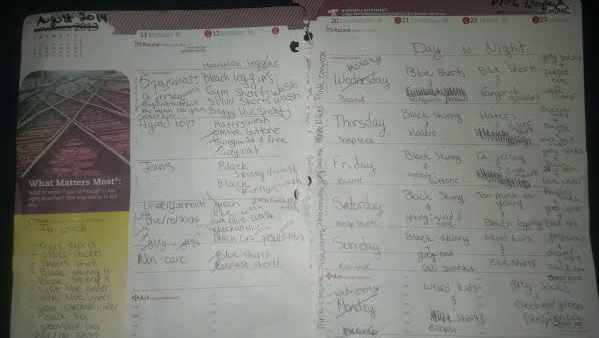 She is one very organized young lady. Have a faaaaaaaaabulous time on your trip, buddy. Bon Voyage! Have a great Labor Day! Ahh, yes – “Golden Girls.” Who knew a bunch of old ladies could be so funny? Great show. I think that’s one that has stood the test of time. Have yourself a great Labor Day, Ron! Hey, your dad makes a list for packing everytime we travel–must run in the family! Well…except for Tara, maybe…and you’re right. I’ve seen dad’s lists, too! Given I spent 22 years traveling as part of my job, I am a master packer. I still keep a suitcase partially packed with essentials. As to a Full House reunion, just no. Tara used to travel all over the state for her job, so it’s no wonder she’s got mad packing skillz, too!